Laos spending 240 billion kip on ASEM Summit just for 120 Mercedes Benz and 11 BMW !! Laos spending 240 billion kip on ASEM Summit !! The government will spend about 240 billion kip on the Asia-Europe Meeting (ASEM) Summit, which includes the purchase of vehicles but not the construction of infrastructure. Mr Phouphet Khamphounvong speaks to the media. 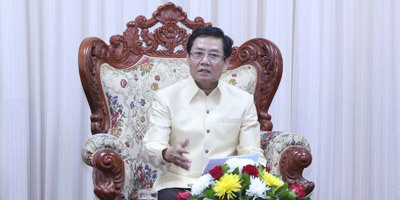 Minister of Finance and Head of the sub-committee responsible for financing and vehicle procurement, Mr Phouphet Khamphounvong, gave the information to the local press yesterday. “Th is sum will be divided into two. Part will go towards the administrative costs of the various sub-committees responsible for organising the summit and the balance will be used to buy the vehicles needed to transport guests,” he said. Mr Phouphet said all the necessary vehicles have been imported as planned, and some are now being used in trial runs of motorcades. Mr Phouphet said about 40 pe rcent or 96 billion kip of the total 240 billion kip will go towards vehicle procurement. The remainder will be used for administrative expenses, not including infrastructure construction and upgrade, which has been funded by other countries. Australia has provided assistance with English language, protocol, and translator training. Singapore is helping with preparations for Senior Officials' Meetings, manual writing, and audiovisual equipment. Pakistan has provided 10 sets of computers.